Frame rate was capped at 30 FPS in old co-op mode. The co-op multiplayer servers were shut down in January 2019. (only LAN play available). Windows version requires an internet connection to launch (no longer requires a constant connection). Game updates by itself. If you have any problem latest patch can be found here. 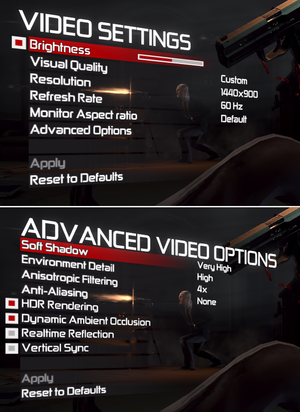 Frame rate is capped at 30 FPS in co-op mode. Single-player frame rate is capped at 120 FPS. Shares the same option with mouse. Only keyboard input is recognized; no mouse input is detected. 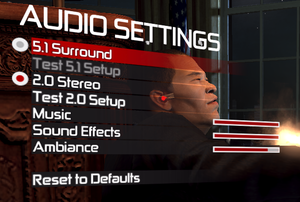 Options only for 5.1 sound. 1) Official localization by «Руссобит-М/GFI». Retail only. Patch for digital release here. 2) Unofficial translation presumably «7Wolf» audio. 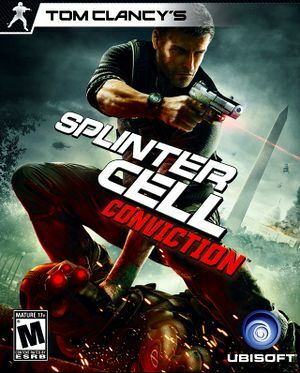 Use Splinter Cell Conviction - 3D Vision Fix. The game will refuse to run when installed on a drive which is managed by a Storage Space on Windows 8 and later. The game will hang on some computers, although audio will still play, the frame will occasionally be frozen for a very long time. After realoading whole level by returning to main menu, it returns to all cores, but game can start behave more stable (eg. Iraq level). You can also consider disabling HT in bios (if you have HT). Doesn't work for Uplay game version, only for retail DVD - required 1.02 Uplay binary unavailable, DRM-less doesn't work - levels won't load. Notebook graphics cards may work but are not officially supported. ↑ 1.0 1.1 File/folder structure within this directory reflects the path(s) listed for Windows and/or Steam game data (use Wine regedit to access Windows registry paths). Games with Steam Cloud support may store data in ~/.steam/steam/userdata/<user-id>/33229/ in addition to or instead of this directory. The app ID (33229) may differ in some cases. Treat backslashes as forward slashes. See the glossary page for details. Verified from a Ubisoft customer support email: "At this time, the multiplayer servers for this game have been discontinued and shutdown"
This page was last edited on 26 April 2019, at 15:00.